When you take pieces of trees and bake them in earthen ovens and burn in barrel kilns, you create blackened, charred pieces of wood which are excellent for cooking, heating, making biochar and health beneficial charcoal for humans and animals. The idea is to use heat to drive out the moisture and gasses and leave charred cellulose behind. The ritual of preparing the kiln and pieces of wood, then building and watching the fire – that connects one with millennia old traditions of gathering around a fire to get work done, stand in ceremony with others, cook or to simply stand hypnotized by its complex, compelling draw and radiant warmth. Used in gardening, the charcoal from a successful burn can be ground or crushed to less than kernel of corn sized pieces and dust. The amount of surface area available in a piece of charcoal is immense. A small quantity of charcoal has the surface area of possible an acre or several. It is nirvana for small micro organisms. Small bacteria and slightly larger life can hide in tiny nooks and crannies, protected from larger ameba and protozoans looking for their next meal. Small life is feasted on by larger life and on and on it goes… the “tropic web” of life. Or as Elaine Ingham likes to say, the “soil-food web” – the soil feeds the web of life which grows both towards the sun and towards the bedrock of the planet for nutrients. Plants convert sunlight into sugars that they exude through their root hairs. This sweating of the root hairs attracts a magical fungal network where agreements and exchanges happen. The fungal networks will use their long, connected mycelium networks to find and transport specific elements, compounds and nutrients that a plant needs. In return for these things, the root hairs offer their sugars. Collaboration and cooperation at its finest. If only us humans could arrange to get along as well! So it is quite possible to say bio-char is a storage cell for sunlight – a battery, if you will. The charcoal stores moisture and provides housing for a vast community of micro-life, which is powered by the fungal-plant interactions, which are powered by the plant’s ability to turn sunlight into complex and simple sugars, emitted at its roots. The bio char can be a powerhouse of energy and activity. The best way to use biochar in a garden is to first run it through a composting cycle. 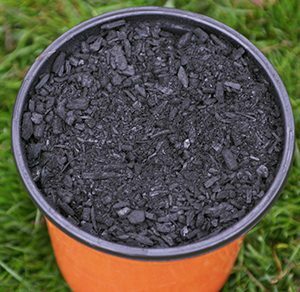 By adding small-sized charcoal pieces and powder to your compost bin, you not only allow more aeration to the compost, you also super charge your biochar with inoculant of that compost batch. … and then there is “carbon sequestration“. Planting bio charcoal is a way of returning carbon to the earth. In many poor counties, there are those who find it easier to clear cut, slash and burn a patch of land, then plant on the nutrient rich soil resulting from the nitrogen flush of the burn residue (see Assert effect) for the next couple years. If they do not actively give back to the soil and build it, their crops eventually such all the useful nutrients out of the soil and pests, disease and low production result. Then they abandon that plot and move on to another. Thanks to collaboration with some local governments and innovative village leaders and outside organizations (yeah I know – some good news for a change? ), “social forestry” projects have taken hold in many other places which are great examples of the three main Permaculture ethics: Good for the Earth, Good for People and Share the Surplus. A living can be made in these places by doing meaningful and rewarding work planting, tending and harvesting from trees. Whole villages have enjoyed many benefits from social to economic from such social forestry projects. Tom Ward of Siskiyou Permaculture in Ashland has an excellent Social Forestry program for us westerners in which we can learn a variety of skills, history and indigenous wisdom while listening to his excellent story-telling and teaching style. 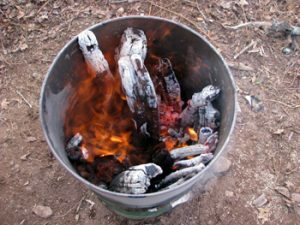 Tom (aka Hazel) has an ongoing project restoring the oak pine savanna in his Little Applegate hills and experimenting with various portable, earth-based charcoal kilns. Gary Gilmore, a Pennsylvania State Forester, is another spirited advocate of charcoal. He has developed a number of interesting contraptions and machines and shows how charcoal can be used for everything from urinals, to “green roofs” to fuel source to produce a gas to run an electric generator or Rube-Goldberg walk-behind tractor.